The last day to see Abstract Expressionism: Looking East from the Far West is Jan. 21—just one week away. It has been part of the museum’s life for more than two years and it’s hard to believe that this milestone exhibition is coming to a close. From the security officers who have had to stand guard outside the gallery every night the show has been up to staff that dreamed up and executed a four-month long slate of engaging programming, the exhibition has required the museum’s full attention. 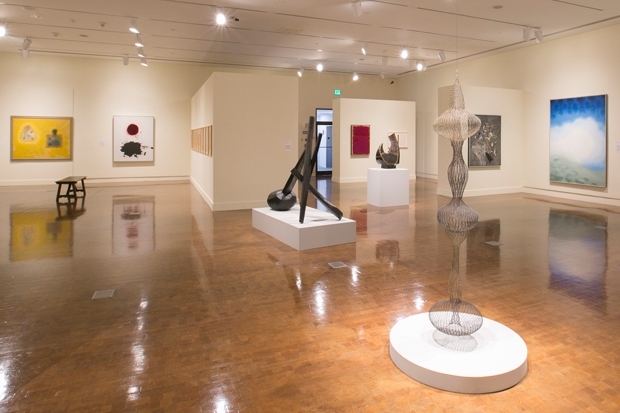 Adding new dimensions to the history of Abstract Expressionism, the show has attracted the attention of the art world. We are honored the show has earned positive reviews from Art Asia Pacific, Hyperallergic, Studio International and Artillery. 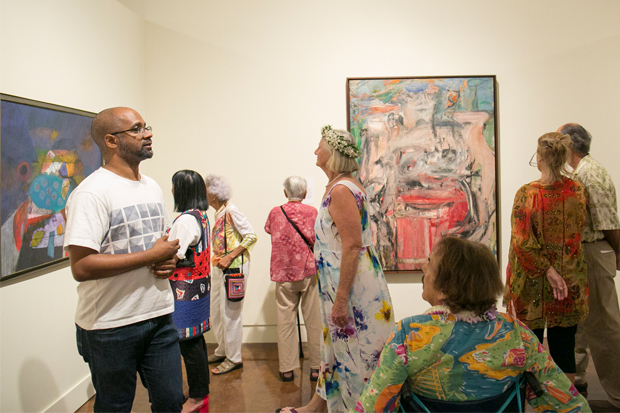 And the in-depth coverage of the show by local media, such as Honolulu Magazine and the Star Advertiser (whose sister publication HI LUXURY is also a generous sponsor of the show), have given residents extra insight into this once-on-a-lifetime art opportunity. Exhibitions, by definition, bring artworks together, but they also bring together experiences, and this one is truly a ‘curated’ set of relationships. It started with conversations: with my friend Jack Gillmar over breakfast at the Pacific Club about how great it would be to do a show focusing on our Hawai‘i artists, with my former director Stephan Jost about how we could take Art Deco Hawai‘i into the post-WWII period, and with my colleagues in the field about filling the gaps in the story of Abstract Expressionism. It grew through the experiences I had as I developed my wish list into a checklist—like visiting Barney and Rebecca Ebsworth in Seattle, seeing their Willem de Kooning, and then mustering the courage to request it for the show; or stopping in on Nancy and Herb Conley under the pretext of seeing their collection but really to hear their stories about how they put it together; or discovering that a piece by highly sought-after Ruth Asawa was right under my nose in the collection of our trustee Jay Shidler; or visiting Gerry Tsutakawa in the studio of his father, George Tsutakawa, which he continues to maintain. And it will live on in the friends I made along the way, like living legends Satoru Abe and Harry Tsuchidana. The end of an exhibition is always bittersweet—especially so with this one!